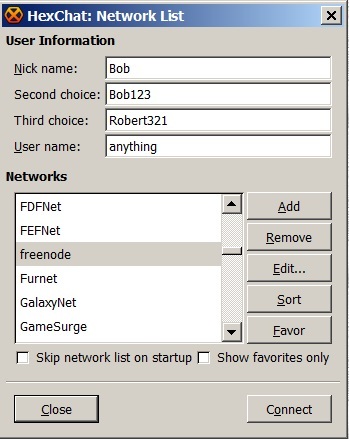 Before downloading the IRC client here is another simple link you can try to enter chat Freenode. If you are using a 32 bit version of Windows install the X86 version of HexChat and the X86 version of Visual C++ 2013 Redistributable. If you are using a 64 bit version of Windows install the X64 version of HexChat and the X64 version of Visual C++ 2013 Redistributable. Once you have downloaded the two files OPEN and RUN each of them to install the software on your computer. 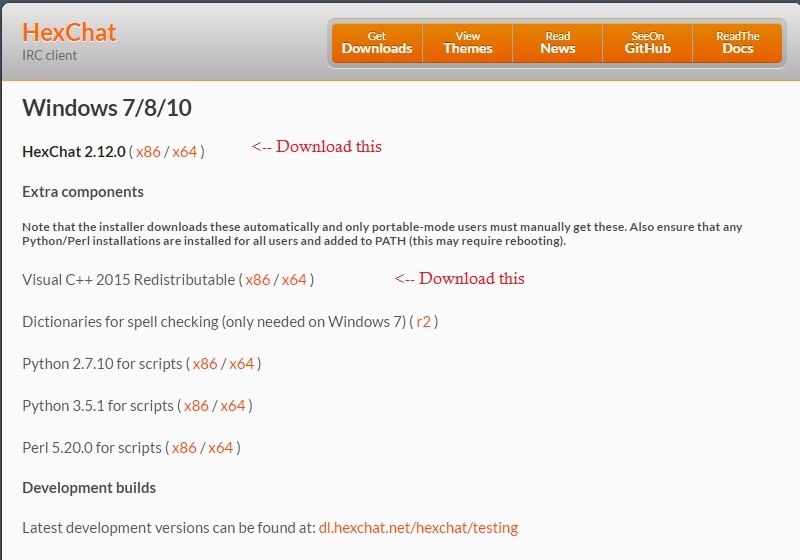 The "HexChat" program is installed in the C:/PROGRAM FILES/HEXCHAT" folder. If a short-cut for this program was not put on your desktop you can find the HEXCHAT.EXE file in this folder to move a short-cut to your desktop. 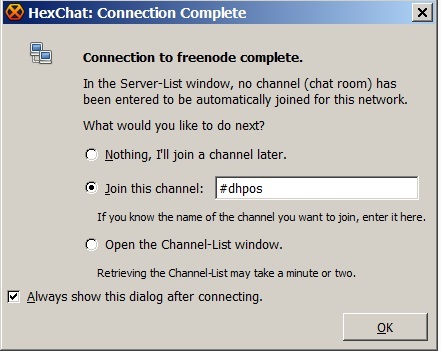 Now it is time to run HEXCHAT.EXE and set it up to access DHPOS chat. You must change the information in the set-up box to your information. Trust me, you do not want to be me. Nick name: This is the name you will be using in the chatroom. Second choice: A name to use if that name is unavailable. Third choice: And a third! If this one is not available it will fail to connect. User name: This doesn't really matter. Put anything you want, even kittens! 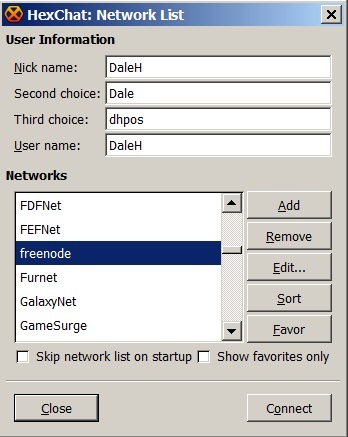 Ensure "Freenode" is selected from the Networks list. Now click [OK] to enter chat. The chat screen will now appear. Type in the text box at the bottom of the screen and then press [ENTER] to post. To exit chat click the [X] n the top right corner of the screen.